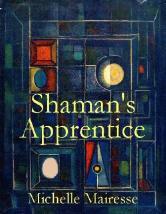 Unemployment Doldrums lead Kimberly Kramer to money, mystery and Millicent Moon, a Shaman-Anthropologist, in Michelle Mairesse's novel, Shaman's Apprentice, just released by Dandelion Books. Kimberly Kramer, unemployed after the magazine she worked for tanked, is astonished when Edith Zeller offers her employment at lifestyle magazine Glitz. Edith is the wife of Glitz founder, Baxter Zeller. When he died, Edith took over the magazine and fired its star journalist, Claudette Kramer—Kimberly's mother. Unable to cope with her downslide on the socio-economic ladder, Claudette Kramer committed suicide. Edith believes that fires, floods, and break-ins, both at Glitz Museum and her home, have a dark, supernatural origin. She is desperate to get to the source of the attacks. Convinced that Kim is the person who can help her, Edith instructs the daughter of her former employee to investigate these suspicious accidents with the aid of the shaman. An equally desperate Kimberly, who already sees ahead of her the same downhill path as her mother if she refuses Edith's job offer, enlists Millicent Moon, a noted anthropologist who has studied with nine shamans. The shadow of her mother’s tragic death hovers over Kim's premonitions about the source of these attacks. As Moon instructs and protects her during a dangerous search for lost Hopi occult artifacts, Kimberly unravels mysteries of her own past, learns to move in other dimensions, and uses ancient techniques to annul a curse and to transform her own psyche. Moral of the story: Pull yourself up out of unemployment doldrums by listening to your inner self. Go where the magic is, and enjoy the ride. She is executive editor of Hermes Press & co-author of Realizing a New Culture.